The legacy in Italy from Rome is huge. At school I have studied Latin for almost eight years. I know Roman history better than any other period – this actually proves my generic ignorance in the subject more than anything else. They made us translate detailed accounts of battles, political treacheries, blood facts, epic legends, and heartbreaking love poems. But there is one topic I don’t remember studying or translating: food. If I have to tell you what I imagine about the food of the Romans, my main source is the comics series of Asterix. I’m not sure about its authenticity, but surely there is a lot of food related scenes in it, and it makes for a funny read. One common belief about Roman food is that it was decadent. Images of wealthy Roman patrizi, leaning on sofas and eating pigs stuffed with birds stuffed with fish stuffed with grapes, served by naked beautiful slaves, come to mind. I thought Apicius was one of the main promoters of this image, but it is probably more down to Asterix, I have to say. I finally took the chance to read the book (translated, imperial latin is not my forte any more) and I found it to be refined, surely, but with very few involved and truly decadent dishes. Not to say that it was not interesting, mind you. It was. Some combinations are surprisingly modern, closer to Middle East cooking than Italian one, with its mix of sweet and savoury. SARDINE LOAF (OR OMELETTE) IS MADE IN THIS MANNER CLEAN THE SARDINES [of skin and bones]; BREAK [and beat] EGGS AND MIX WITH [half of the] FISH; ADD TO THIS SOME STOCK, WINE AND OIL, AND FINISH [the composition] BY HEATING IT. WHEN DONE TO A POINT, ADD [the remaining part of the] SARDINES TO IT, LET IT STAND A WHILE [over a slow fire to congeal] CAREFULLY TURN OVER [dish it up] MASK WITH A WARM WINE SAUCE, SPRINKLE WITH PEPPER AND SERVE. (see translation notes for additional details). From the procedure it is not quite clear what this dish is: it could be anything from a sort of souffle to a frittata. As much as the ingredient combination sounded unusual to me, I found out that several modern versions exist egg dishes with fresh sardines or anchovies. Most italian versions include some cheese like pecorino or parmigiano, with parsley and garlic to add aroma. Some spanish tortilla recipes sound quite similar to Apicius: many have a layer of beaten eggs, the fish is added on top after a while, more eggs are used to cover it, and the tortilla is turned at last. I went with what I knew. I made a frittata, adding the fish in two times although that sounded a bit weird. 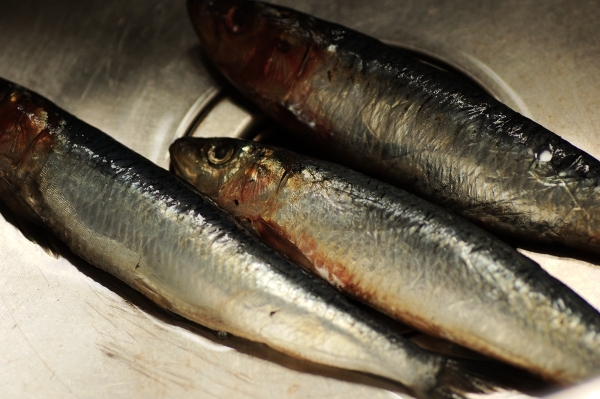 Sardines are a good, sustainable source of fish. Although bones are not an issue in the sardines I buy in Italy, I found the bones in the Cornish ones available here to be more abundant, thicker and harder to get rid of, should you want to. This is the only caveat I feel I should add to the recipe: if you are squeamish about fish bones, this recipe is not for you. From a taste point of view, though, it was a total success. It does not taste weird, it does taste complex and delicious and slightly unusual. The eggs and the fish are distinctively sweet, and the wine and garum sauce I made up, trying to recreate the elusive oenogarum, added a savoury and acidic note that stroke an amazing balance, overall. The garum tastes of fish, but not much. The aroma is so intense it is quite difficult to describe it. It is more aromatic, indeed, that the Far East equivalent I have tried so far, although I’ve yet to try a high quality one. It is also quite salty and very potent. Initially I thought the oenogarum to be too strong and salty: with the eggs, it was not. If you are curious about what other people made of garum, there are several entries at Laura’s. If you want to try some of these recipes without having garum, I’d probably use a mixture of nuoc mam and melter salted anchovies in oil: go for the best you can buy. There are also plenty of recipes in Apicius that don’t really include garum, or where it can convincingly be replaced by salt. For the wine sauce: bring wine, bay leaf and pepper to the boil. Boil until reduced to more than half of the initial volume, add the garum and turn off the heat. 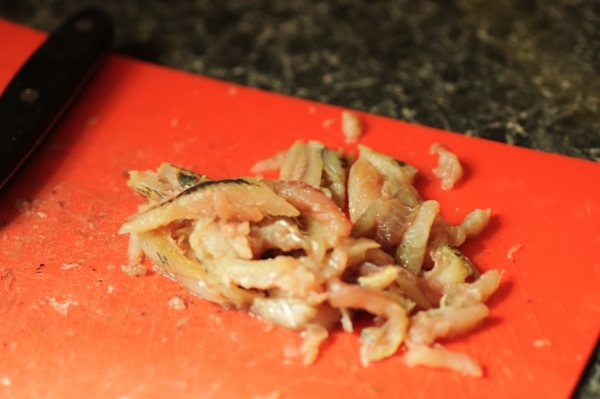 Clean the sardines into fillets (you can keep the skin if you like it). Beat eggs, wine, pepper, a dash of garum, a tablespoon of oil and water to a mixture. Add some salt, sparingly. Mix in half of the sardine fillets. In a smallish non stick pan add a tablespoon of oil, then the egg mixture. Cook for a few minutes until the bottom is almost set. Add the remaining sardines, cover and cook gently for a further five minutes. When the top is solid, slide to a dish, turn and put back on the fire for another couple of minutes. To serve, drizzle the frittata with the wine sauce (taste before adding all of it, you may find it is too salty and you don’t need it all) and add some freshly ground white pepper. A lovely post! That frittata must taste so good. A beautiful recipe. Looks like a great way to use sardines! My boyfriend doesn’t like them, but scattered inside an eggy dish… perhaps…! It seems we both were lured by eggs as a medium for the amazing garum. I love the sardines in the dish and agree with you that it gives the eggs a subtle, “can’t quite put your finger on it” flavor. No fish sauce I have ever tried comes close to the complexity of the sauce. Great to discover your blog! Kudos to Laura for making garum and to you for trying it. Now, of course, I am curious, though I am not quite at the point of wanting to make some. Love the photo of the sardines. What an interesting read, I realy enjoyed this post. I have read about garum and always thought it would be an interesting condiment to try. The little I know about food in Roman times certainly places it closer to Middle Eastern food and flavor combinations than modern Mediterranean food (perhaps because important ingredients such as tomatoes were still lacking!). That and lots of grains and legumes. I will certainly go and read your links. Thanks! How lucky to get garum! 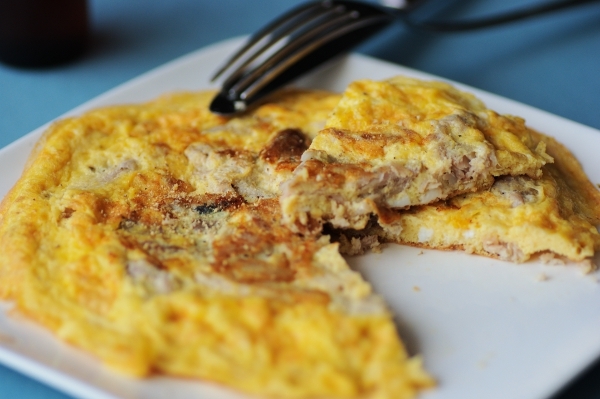 I bet a drop of the fish sauce brought your frittata to another level. I have a friend who prepares it herself and uses it in ancient Greek symposiums she prepares. In ancient Greece they prepared garos (or garum in latin) and it is documented back to the 5th – 8th century b.C. I think the closest thing prepared nowadays is Asian fish sauce. How nice to receive this precious elixir in the mail from the US of all places! I bet it would liven up many a dish and the choice of this dish with sardines is perfectly fitting!